The Director General of Team Bindow Campaign Organization, Hon. Ibrahim Abdulmumini Song, said Senator Mohammed Umar Jibrilla, has performed excellently within his three years in office. He said considering the scenarios that characterized his emergence as the Governor of the state, nobody expected this gigantic rapid development of his administration in the state. Song maintained that “Senator Jibrilla came at a time where the whole state were at a point of trajectory. A point where the state was witnessing severe attacks of the dreaded insurgents Boko Haram. He surmounts the courage and mobilized all the security agencies in the state to fight the insurgency till they recaptured all the five local governments that were already captured by Boko Haram. Secondly, when he came on board the infrastructural development of the state were seriously in shamble, most of the road network across the state were not motor able, he made concerted effort to make Adamawa state look like the Federal Capital Territory, Abuja. A new comer to the state will testify that Adamawa state has been transformed, before the state was in darkness but now there is light everywhere on the streets of the state to the extent that even a needle fell from your hand, you can bend to pick it because of the street light. In terms of agriculture which has been neglected for years by the previous government, Governor Bindow has purchased five, five Tractors and was given to each chairman of the twenty one local government’s areas of the state to be hire to farmers on subsidiary rate. On education and health, the governor has done tremendous well. He has renovated the dilapidated schools and hospitals that were not given attention by the previous government. The Primary Health Care was at moribund stage before is now delivering a twenty four hour service in all nook and crannies of the state. Additionally, he has renovated and equipped three to four big hospitals in all the three senatorial district of the state to offer befit health service in the state. On education, the governor has made serious effort by making sure he renovated the schools most especially the ones that have been vandalized by the activities of Boko Haram. Moreover, in every senatorial zone of the state he picked three schools in three local governments to be renovated in every three months and so would move to another zone and do the same. Therefore, if you count it all, governor Jibrilla has surprised the people of the state most especially his critics with his developmental strides in just three years in office. He has done what people did not expect he can do in three years of administration. Vehemently, “I can tell you he has done the best he has given Adamawa state a better representation of his social infrastructural development of roads, health care, education; agricultural etc. Thus, to me this is a symbolic achievements receiving from the person who people have least expectations from him. Consequently, the former lawmaker stated that whoever think the governor is playing a religious politics should stop making such frivolous aspersions because all the critical appointment of the governor is fifty fifty. He epitomized Adamawa State University as the best example of governor Bindow’s non tolerance to religious matter when it comes to terms of appointment. He noted that when ADSU was engulfed with management crisis, he (Bindow) observed who can handle the institution very well, he discovered that his then Commissioner of Education, Professor Kaletapwa George Farauta, can do that, he asked her to move to the University and go and sanitized it. She is a Christian succeeding two successive Christians Vice Chancellors in the institution. Likewise, the Local Government Service Commission. Senator Jibrilla having observed well the person that can restitute that institution was Dr. P. P. Power who is a Christian and he appointed him as the Chairman of the Local Governments Service Commission. His Commissioners are fourteen against twelve, i.e. fourteen Muslims and twelve Christians. Also, the head of the six tertiaries institutions of the state, three are been Mann by Christians and three by Muslims. There is no sentiment in any area of his appointment. To crown it all, even the appointment of Alhaji Ibrahim Bilal as the Chairman of our great party, the All Progressives Congress (APC), was orchestrated and masterminded by Babachir, it wasn’t Bindow”. Song told our correspondent that it was the former disgraced SGF Lawal, who brought Bilal’s name. “Bindow wasn’t interested but for the sake of peace and tranquility he bow down to his wishes. But as time goes on, Bilal towed the path of harmony with the state government, haven’t done that, they say it is a taboo for him to do that, they wanted him to dance to their tune that was the Genesis of their allegations against the Governor. However, I want to ask those who are clamoring for leadership change in 2019, who will be the substitute to Senator Bindow? Or do they want to change him because he is not sharing the millions of Naira the way it used to be with the previous failed administration? It cannot happen like that because Adamawa people voted Bindow for a change and they are enjoying his administration infrastructural development. “I want to call on the good people of Adamawa state to give Bindow the second chance to accomplish what he has started for the state. Adamawa State has no alternative than Senator Jibrilla comes 2019. He is the only person that has the state at heart and he is working for the betterment of the state. We have so much believed that whatever his critics are doing they will not succeed and we are working round the clock to make sure we bring Bindow back in 2019 by the special grace of God.” Conclusively, I am assuring you without doubt in my mind that because of Senator Mohammed Umar Jibrilla’s tremendous achievements he is coming back in 2019 by Gods’ grace, he ended. Also speaking, Senator Mohammed Umar Jibrilla’s three year administration has been described as a years of revolutionary in terms of infrastructural development. The State Focal Person of the Social Investment Program who doubles as the Senior Special Adviser to the Governor, Commodore Sali Usman Bodes retired made the assertion in an interview with the Finder Newspaper Correspondent on the governors’ third year anniversary, in his office at Yola. Retired Commodore Bodes stated that so far Senator Jibrilla’s administration is the best in the whole north eastern states, in fact, if not to exaggerate, the best in the whole federation considering his tremendous achievement within short spell in office. Even though, he admitted that there are some aspects which the Governor has not touch but said no government can carry all facets of development at the same time especially considering the financial constraints bedeviling the nation. 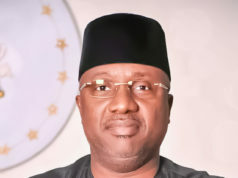 However, the Focal Person bolstered that with all this financial turmoil, His Excellency, Senator Jibrilla was able to utilize the little resources available to him to revolutionize the state with his social infrastructural development, stating that if he can be able to achieve this, no contender will withstand Bindow in 2019 general elections. He noted with a queried that what is always expected from every government are, progress, development and understanding of the yearnings of the masses and Bindow have balanced that by carrying everybody along in discharge of his administration, what else is expected of him that he has not done within this short periods of administration? Furthermore, the Senior Special Adviser to the Governor noted that Senator Bindow’s achievements are visible, adding that his achievements can be seen on ground, they are nothing that until you go to media before you announce it to people. So whoever that is wasting his/her energy or time in fighting the governor should reserve it for another thing else. According to him, he did not see a contestant that can beat Bindow in 2019. “My only appeal to the governor is to invest more in our Social Investment Program to enable us to start all the clusters in the state most especially the school feeding program because this is the only area people are crying and complaining that is having a chameleon movement as of now. Again, in the next two weeks, we are expecting the Vice President in the state, we need to be funded moderately so as to meet the overhead cost for the various clusters,” he pleaded. He said there are a lot of financial requirements involves in the program, they need vehicles for monitoring and evaluation, accommodation; office and office furniture, running cost for the maintenance of the offices. He noted that once an office is created, it is the state civil servants that will be seconded to work there but all they want is the money for the overhead cost to enable them convince the Federal Government that all clusters of Social Investment Program is fully on ground in Adamawa State. Maintaining that once they achieved this, the major funding will be coming from the Federal Government and World Bank. Finally, Commodore Bodes retired end his speech by drawing the attention to the good people of Adamawa state to rally round governor Bindow comes 2019, stating that Senator Jibrilla has done well for the state and let them give him the second chance to consolidate what he has started. Moreover, people should learn to be patient because no administration can meet the need and requirements of it society at a glimpse.